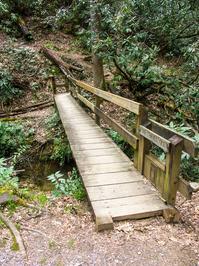 This trail is located in the Davidson River area. For a list of all the trails in that area, see the Davidson River trails list page. Starting at the Davidson River Campground, the trail ascends Shut-in Ridge (not to be confused with the Shut-in Ridge near the French Broad River further north, where the long Shut-in Trail begins). It travels through Cat Gap, around the south side of Cedar Rock Mountain, and down into Gloucester Gap, marking the end of section 1. Jaybird said: This section of the trail is awesome..... if you love elevation change. While 12 miles in length, that doesn't account for the steep changes of up and down along the route. Its a walk... not for a beginner hiker, especially if you are walking with overnight gear in cold weather. I did this section in November with @ 30lb of gear and my 40 yr old knees were so sore in the morning that I could barely walk back out. But still, I loved it. It was my fault for not being better prepared and for over-packing... and for not having walking sticks. The part that killed my knees were the descents with a heavy pack. All that shock on the knees was too much. This is a great hike to test out whether your ultra-light setup is good enough.